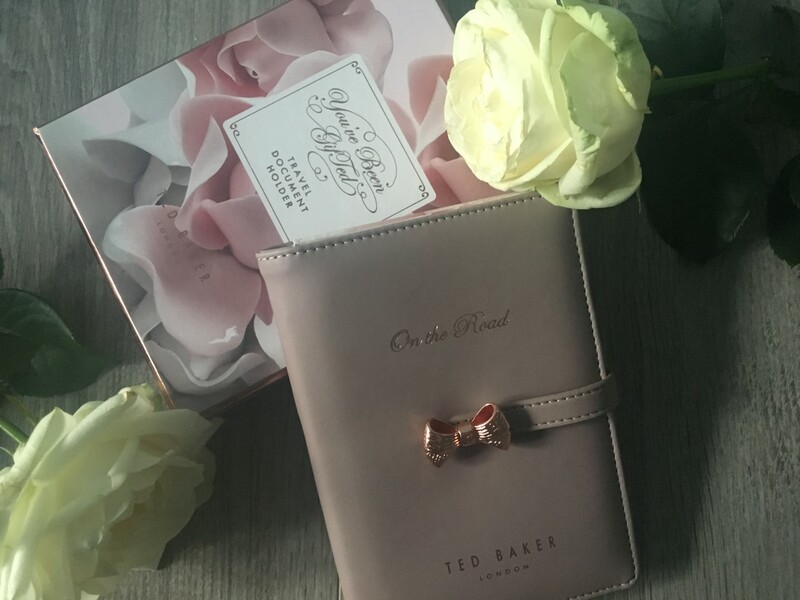 First of all, I just want to talk about how beautiful the packaging is; which is always the case when it comes to Ted Baker. 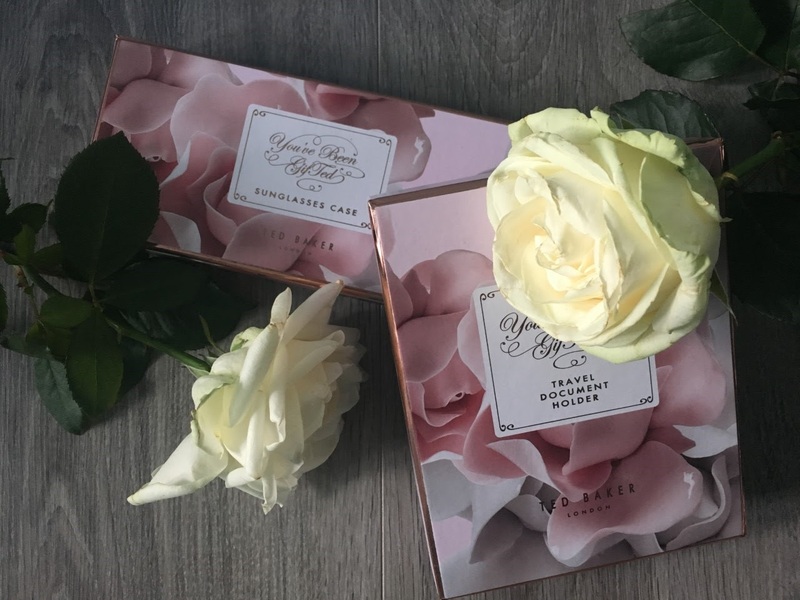 They both come in these boxes with the porcelain rose print on the outside with rose gold detailing. These would make perfect presents for people who travel a lot, whether it is to work or abroad. The boxes are so pretty that I am going to keep them and have them on display in my bedroom; and also it will be handy to keep the case and document holder in their boxes when I am not using them so I don't ruin them. You can see how much thought has been given into the packaging, and the boxes look as pretty as the pieces inside. They also say "You've Been GifTed" which incorporates Ted into the word gifted. I just think these would be so nice for graduation presents, birthday presents or to be kept aside for Christmas if you want to start shopping early and putting presents aside. I have been looking for a really nice sunglasses case for some time now. I only have one case for my sunglasses which I got in River Island earlier this year and it is great for larger rimmed sunglasses, but the case is too big for my aviators. When I saw this Ted Baker case I tried my sunglasses inside and they fit perfectly. I would probably struggle to fit my larger sunglasses in this case but it is perfect for my aviators, which are the ones that usually break at the bottom of my bag anyway. It is so easy to assemble as well because you just unroll it and then there is a magnetic strip which turns it into a case that will protect your sunglasses. I absolutely love this pink rose print that they have chosen as well, mixed with the taupe intetior and the rose gold hardware. 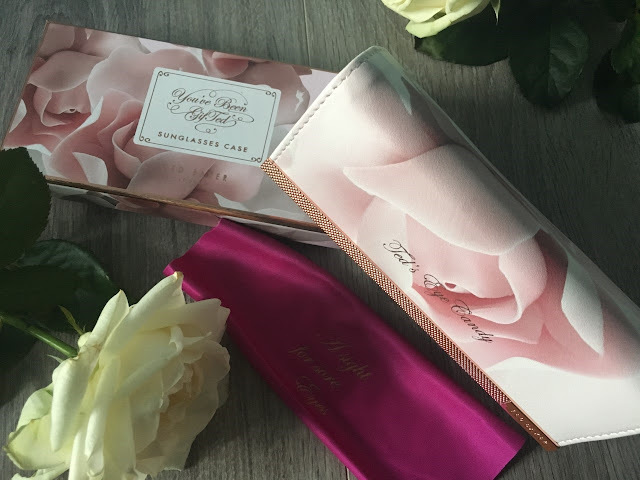 I think this would look pretty on anyone's dressing table but it is also so practical as when you are travelling and wearing your sunglasses, you can fold the case down so that you have more room in your handbag. It also comes with a fuschia cloth that can be used to clean your sunglasses which is also really handy as I am often having to wipe my sunglasses on the edge of my dress to clean them. Also, on the case there are the words "Ted's Eye Candy" in rose gold lettering and in the same lettering on the cleaning cloth is "A sight for sore eyes." They have put so much effort into the detailing of this piece and I absolutely love it. It is £30, which is quite expensive for a sunglasses case, but you really are getting a quality piece and it is so practical especially for travelling. 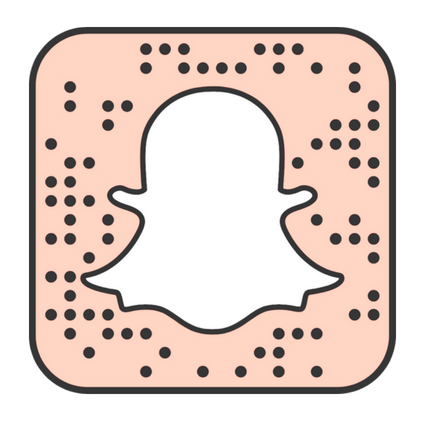 I am going to be doing a lot more travelling over the next year, both in England and abroad; and I have been looking for something that could hold travel documents for so long. I did see a travel document holder from Ted Baker a coupld of months ago for £99 I think, but that was just too expensive. So when I saw this travel document holder and it was only £40 I knew I had to get it. It basically looks like a passport cover and is in this gorgeous taupe leather. 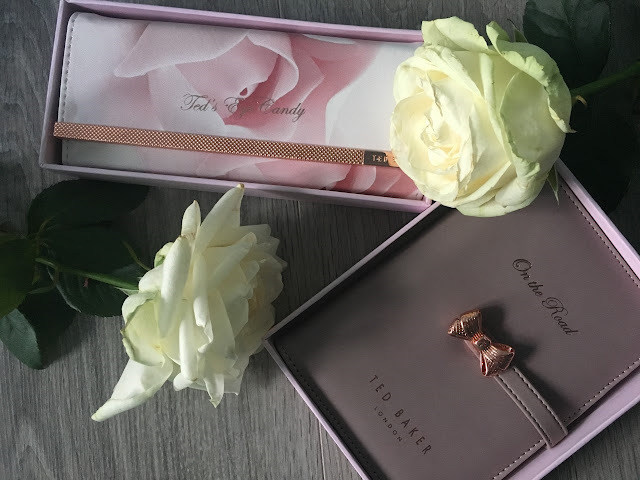 In rose gold lettering it has the words "On the Road" and it is secured with a popper and a rose gold metal bow covering the fastening. 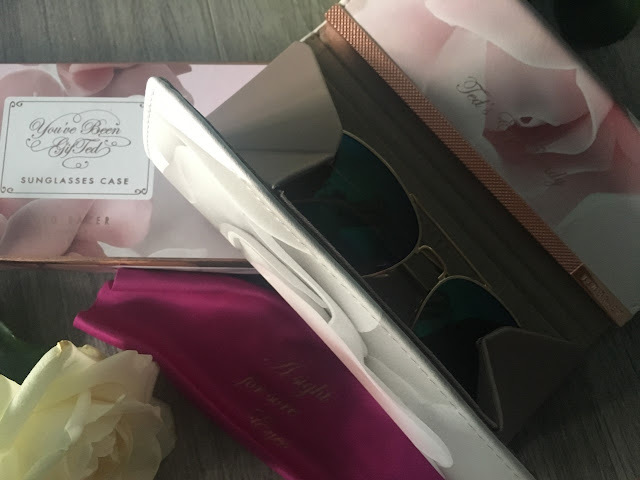 Inside is the gorgeous porcelain rose print which is on the sunglasses case; so I love the fact that it matches with my case as well. It then has a couple of large section to hold documents or maybe eveb your passport. Then are slots as well to hold train tickets or your oyster card. There is also a clear section for your ID and then a small little pocket to hold other travel items. 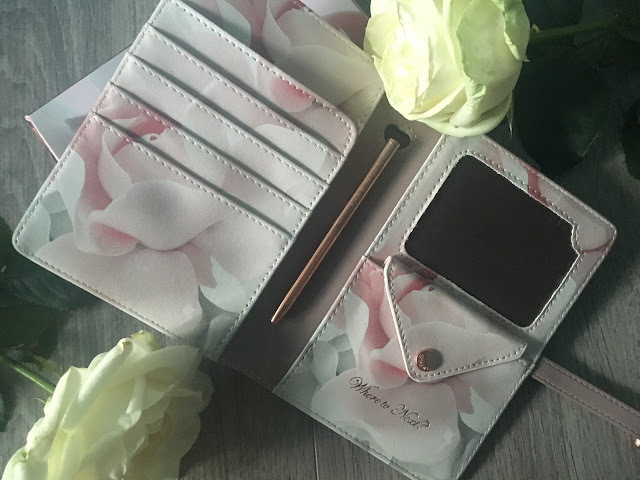 It also comes with a rose gold pen, which is really handy because I am always losing pens in my bag and I can never find one when I need them. You can fit so much in this one holder, and it is perfect for taking on the train or even when you are going on holiday. I think this is so handy for anyone who travels a lot and wants to keep all their documents in one place. I am always trying to keep my documents together and it is so difficult when you don't have a wallet or something to keep them it, whereas with this holder you can keep everything together and know that it is safe. The only thing you would not be able to keep in this travel document holder is boarding passes, however Ted Baker have larger versions every so often, usually in the Spring time where they are designed more for flights. However, this is smaller and is just so practical as I will be travelling to London a lot more from January onwards and it will be handy to keep my oyster card and train tickets together. I tried to find links for these products on both the John Lewis website and the Ted Baker website but unfortunately I could not find them anywhere. These are very new pieces to the collection and I don't know if they are exclusive to John Lewis, however, I will keep an eye out when they are made available online and I will tweet the links to these pieces when they are. So make sure you are following me on Twitter to see when these are made available online by clicking here. Also, they should be available in store if you have a John Lewis store near you.